So blog.google.com is, well, Google. Is this a Freudian glitch? Last week I mentioned the weird relationship between blogs, Google and pingback spam, but discussion of the larger issue goes further back. The person who first put this in clear terms for me was Mary Hodder, who talked about moving from a static Web, with sites updated infrequently, toward a ‘live’ or dynamic Web. The problem for Google is that rapid linking makes their search returns erratic, most famously with Google Bombs. The search engine may do some tweaking á la PageRank, or look to assuage the effect of blogs through the NoFollow html tag. They may try to segregate the Web by putting ‘Blogs’ here and ‘Everything Else’ here. But even that gets messy, and perhaps the problem is reaching critical mass. 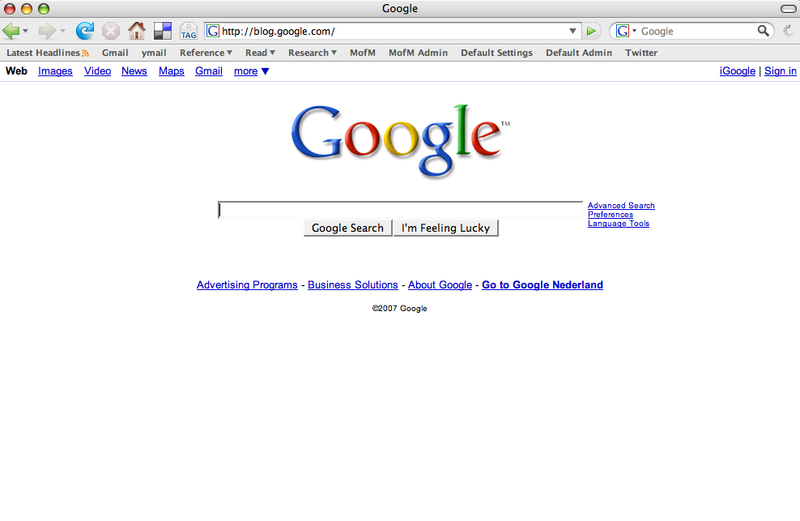 Maybe http://blog.google.com is trying to tell http://www.google.com something. I think we can also no longer really talk about a static/dynamic web division. If blogs are being separated into the two, what is next?